Welcome to our Robotics & Coding Club at Kullerstrand Elementary! We are so proud of our students! As we enter our third year of robotics, we continued to carry forward our theme of PROFESSIONALISM. Becoming a member of the robotics program is like getting a job at a company like Google. Students (grades 3-5) have to fill out an application, get a teacher reference and sit for a one-to-one interview. To remain in the club, students must maintain professional behavior, not just during club sessions, but throughout the week in the classroom as well. They must also stay up with classwork and demonstrate solid school attendance. 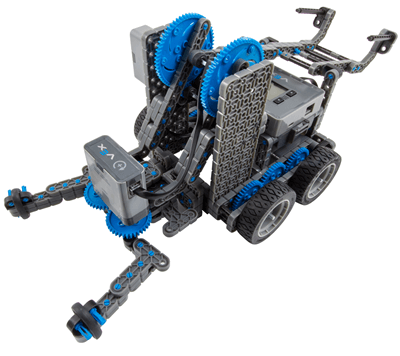 The robotics platform we use is VEX IQ. These are real robot components requiring thoughtful design. Students must work in teams to come up with robots capable of solving problems under pressure on a competitive playing field. Last year, Jeffco hosted its very first official VEX IQ competition, and Kullerstrand had 9 teams representing them. To cap off the season, we were treated to a tour of the School of Mines campus by their robotics students. We are really looking forward to the next season and anticipate even greater things as more Jeffco schools will have VEX robotics teams! Kullerstrand's Robotics Club was featured on Jeffco's video channel JPS-TV. Watch it here!